DmC is back, finally, in a new engine. Here's how our first play session went. Nero has lost his demon arm from Devil May Cry 4 and replaced it with a succession of disposable robot arms in Devil May Cry 5. In the playable Gamescom demo, disposable robot arms litter the streets. I find one on a ledge near some fridge-sized insect monsters. I find three in a plaza just before a boss fight. Devil May Cry is hardly the most realistic hack-and-slash series around, but this is bizarre. There are two types of robo-arm in the demo: blue and green, though the final game will have eight versions. The blue arm has a thrusting electric attack. The green arm gives you a spiraling upwards leap attack that takes enemies with you. Nero automatically equips the most recent arm you‘ve picked up, and the only way to switch to another arm is to blow your current one to ash using the left bumper on your controller. The explosion serves as a big area-of-effect combo finisher, or an over-the-top way of discarding an arm you don’t want. If you run out of robo-arms you have to keep fighting one-handed with Nero’s traditional sword and gun. The new arm attacks look and feel powerful, and they provide more variety than the old Devil May Cry 4 devil arm, but it feels strange to have a part of Nero’s moveset change based on what he runs across. I can see the intent. There’s a risk/reward dilemma to choosing where and when you detonate an arm. You can also charge up your arm attack—referred to as a ‘devil breaker’—but if you take a hit during power-up the arm breaks uselessly. The system also raises the skill ceiling for players who want to master the game. To earn the most slick, high-scoring combos I expect you need to know how each arm fits into a chain effectively. In this demo the green arm was a great initiator because you can carry a couple of enemies into the air and start juggling. The blue arm blasts enemies back, so if you want to continue a combo you need to lasso the flying demons with the arm, or go chasing with a lock-on thrust attack. Hopefully, all eight arms have distinct characteristics that give them a combat role you want to work into combos. I love the improvisational combat and sense of speed and flow in Devil May Cry, but I found the constant switching of this important robo-arm move disruptive during my 30 minutes with the demo. You are seemingly never forced to throw away an arm, so you can theoretically stick with one you like for the level as long as you don’t access its most destructive abilities (blowing it up). That’s clearly not how you’re supposed to fight, though, and in this demo the distribution of the arms in the environment felt arbitrary and difficult to plan around in the middle of a breakneck fight. Apart from the new arm mechanic, everything else is very familiar, and technically impressive at points. This is easily the best-looking Devil May Cry game, and though the demo lacks the outstanding musical drops DmC built into its combos, the tone of DmC5 seems perfect. Nero’s put-downs would make Dante proud. There are fundamental problems that worry even more than the arm system, however. The camera was a complete mess for several sections in this demo, especially during one fight in an ordinary boxy interior. As I rotated the camera to try to lock a target the camera zoomed in and out erratically. In the same fight I couldn’t effectively target a flying mosquito demon before it squirted inspiring demon venom on nearby foot soldiers. During the boss fight, the camera regularly tried to wrench me away from the destination I was trying to reach. When I tried to dash for a health globe in the ruins of a nearby health fountain, I had to go to war with the camera, my right stick fighting the game’s urge to swivel back to the boss. I’m used to these problems coming up occasionally in third person fighters, especially in boss fights—the Devil May Cry 4 Berial fight had some squiffy moments for example. But the poor camera in bog-standard fights needs to be addressed. It’s frustrating. 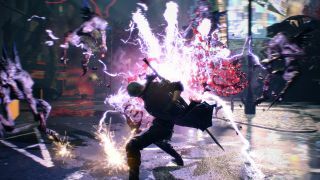 All the core ingredients for a compelling new Devil May Cry are present in this demo, but it doesn’t feel connected and fun yet. Part of that may be my unfamiliarity with Nero’s new robo-arm techniques, but there are definitely camera and control issues getting in the way of the smooth SSS combos I crave. I love the series, and I dearly want it to come back strong, but Devil May Cry 5 needs to be better than this demo if it wants to take its rightful crown as the best third-person action game on PC.